And when I say vacation, I mean I have been super occupied with school. Its my first semester back after being away for one and already I am stressing out! Anyways, back to the point! So between my crazy schedule, I made time to create a new template for LovelyParis. I hadn't created a template in awhile so I wanted to sit down and make one. I think so far this is one of my favorite ones. It took me awhile to piece everything together with the background and making sure that it adjusted to all widths and that everything was good. I really felt inspired to make this template from on one of those days where I just get lost looking at illustrations on CreativeMarket. I don't know why I named it Penelope Day, just really like the name Penelope and it looked cute written in that font. I love the colors and the floral scheme of the template, and I hope that you all like it too. 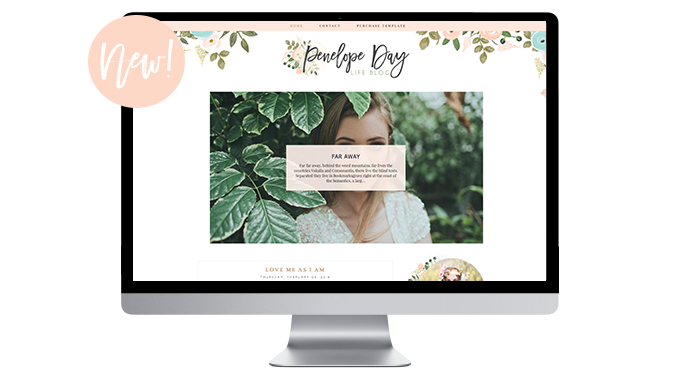 This earthy template is a great one to give any blog that refreshed, lively looking feel to it. Let me know what you guys think about it and what is your favorite template from our store? This is beautiful, Maria! I love all of your designs!